The 1960s were all go. The babies who were born after World War Two were now having their own babies. The Maternity Home on the corner of Hall and Taylor Streets was opened and the first baby, Denise Bergmann, was born 7 October 1962. By the time the Home had its fifth birthday, over 1,000 babies had been born. The Plunket Society was in great demand and by 1965, with over 800 preschoolers on the roll, Cambridge gained full branch status. A nurse had started in Cambridge in 1917, travelling each Friday from Hamilton. Her district covered Morrinsville, Matamata and Putaruru as well as Cambridge. In 1930 the town raised money for Plunket and Ladies Restrooms and these stood next to the Post Office. The Plunket rooms in lower Victoria Street were opened later, in 1971. In 1957 an enthusiastic group started working towards providing a Free Kindergarten for Cambridge. A £2 to £1 subsidy was given by the Government in 1962 and with £2,000 already raised, work was started on the building in Victoria Road. 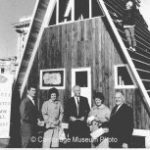 In November 1962, children began attending and after the grounds were finished the opening ceremony was conducted by the Mayor, Walter Milicich, in February 1963. The ½ acre of ground was donated by the Cambridge Croquet Club, the architects were White, de Lisle & Fraser and the builder was G J Veldwijk. The first teacher was Miss Averill Castaing assisted by Mrs E F Henry. A private kindergarten had been running in Leamington, in the Parish Hall in Burns Street, since 1958. Fundraising for a Free Kindergarten started in 1964 and in 1968 the tender of $14,185 was let to Peeters Construction Ltd to build the Kindergarten in Thompson Street next to the Scout Hall. The first teachers were Miss Kerral Hunt and Miss Miriam Symons. In 1965 Parents Centre started in Cambridge with ante-natal classes for 41 mothers. In five years the number had increased to 116. Schools saw changes as the High School moved to new premises in Swayne Road in 1961/62. The Intermediate took over the old High School in Clare Street and by 1966 was ready to open its new assembly hall. In 1964 fundraising started for the University of Waikato’s Halls of Residence and the Cambridge sixth form students were looking at an alternative uniform. Boys’ caps were no longer compulsory. In 1967 Mr F J E Baillie presented a lectern to the High School (made of kauri from a counter of one of Cambridge’s banks) to commemorate his 13 years teaching at the school. And in December the same year Miss Tilly De la Mare retired. In 1969 Karapiro Hydro and Taotaoroa schools closed and the Intermediate School accommodated an extra 15 pupils. Television came to Cambridge in May 1962 and it was not unusual to see crowds standing on the footpaths outside the electrical shops peering at the TV through the window. A new mast on Te Aroha helped reception in 1965 and not long after Coronation Street followers mourned the death of Martha Longhurst, the beret-wearing, bespectacled gossip. By 1969 colour television was on the horizon. Centennials were celebrated in the sixties. In 1964 Cambridge celebrated 100 years as a town. There was a grand parade and a re-enactment of the coming of the Militia performed on Victoria Square. The businesses dressed for a week in Victorian garb and a monument was unveiled at Te Koutu Domain. The Centennial Swimming Pools in Williamson Street were opened later after much fundraising. In 1966 the Cambridge Primary School celebrated 100 years with two sittings for lunch in the Town Hall, cutting the cake and class photos with pupils from 1881. There was a Victorian ball in the Town Hall and teenage dance at the High School Hall on Saturday evening. In March 1967 the Methodist Church celebrated 100 years in Cambridge and produced a book ‘A Great Cloud of Witnesses’ written by Rev Len Shapcott. They held a service, showed historical slides, had a garden party and finished off with a social. In 1960 the Girl Guides opened their new hall in Te Koutu Domain. There were two guide companies, one with Miss Gladys Holt and the other with Mrs Nancy Boyce. A new company had also started at Te Miro with Mrs Langlands and in 1962, her daughter Heather, became Cambridge’s first Queen’s Guide. The two Brownie companies were led by Miss Margaret Willis (now Vosper) and Mrs Helen Seymour. There were long waiting lists so Horohora started its own Brownie Pack at the end of 1963. It wasn’t until 1964 that the Guide hall was finished with the Lions Club adding the toilets and kitchen and Rotary becoming the ‘Godparents’. In 1964 the Red Cross started delivering Meals on Wheels. The first eight meals were authorised by the Waikato Hospital Board, cooked by the Cambridge Maternity Home and delivered by Red Cross. In 1967, after 28 years in Cambridge, Red Cross opened their brand new rooms in Milicich Place. The Borough Council gave the land and Rotary members acted as guarantors for any debt. When the Red Cross started in Cambridge in April 1939, sewing bees and classes to train young women in home nursing were the main activities. The trainees later became a properly constituted Voluntary Aid Detachment and during World War Two Miss Joan Meredith and Miss Lily Bone (Saunders) were selected to serve overseas. A weekly bring and buy was held in Victoria Street, and members were constantly sewing and knitting for hospitals; navy, prisoner of war and refugee parcels. The Junior Red Cross flourished and for many years there were about 300 financial members. In 1960 the seven Kiwi Flats, erected after World War Two to relieve the housing shortage, were removed. On this land were built Pensioner Flats now known as Dallinger Court. The first six flats (built for £9,350) were finished in 1965 and rented at £1 12/6d a week. By the end of 1967 another thirteen flats were available. By 1969 another nine and Council was looking at building ‘Own your Own Flats’ in Victoria Road. Fund raising for a rest home in Cambridge was started in 1964 by the members of the Fencourt Country Women’s Institute. The idea evolved from their August meeting when their president Mrs Sheila Pidduck – ‘spoke on the suggestion of raising funds for the building of flats in Cambridge for elderly and asked members to think about it during the next month’. “Naturally it will be a long term project,” she said “but women’s organisations have shown in the past that when they set their minds on a definite aim, nothing is impossible”. £1 15/- was the first donation. Then collecting pennies, rags, newspaper and tea coupons; making and selling lemon honey and marmalade at Cubis’ Foodmarket; and long-legged dolls and golliwogs were made and sold to Farmers. Department Store in Auckland. Raffles, peach stones, plants, regular bring and buy stalls all added up over the next two years. A Trust Board, headed by Stan Payne was formed in 1966 and from there, with the backing of the town, the idea grew into reality. Resthaven was the result. In 1966 the Senior Citizens built a hall to cater for dancing, bowls, cards etc. On 4 September 1961 the Waikato Savings Bank opened their branch in Victoria Street Cambridge. 432 customers, all becoming Foundation Members, opened accounts on the 4th and 5th September to the total of £69,764 15/1d. And within two years Cambridge had topped £500,000 to become the fastest growing Branch in the Waikato. The Red Cross and Kindergarten were the first in Cambridge to benefit from the Waikato Savings Bank grants. Since then the bank changed premises in 1966 and names – Trustee Bank Waikato in 1983, Trust Bank Waikato in 1987 and WestpacTrust in 1998, now Trust Waikato. In 1988 Trust Bank took the initiative in Cambridge and installed the town’s first outside Automatic Teller Machine. There was commercial growth in the 1960s. In 1962 Taupo Totara Timber Co Ltd moved down to Carters Flat. Annette Thompson bought the beauty salon Marcia Coiffure in 1965, and changed the name to Salon Antoinette. In 1964 the Fergusson Bridge was opened (the third bridge in Cambridge’s history to have been erected on the same spot). The bridge was named after the Governor General Sir Bernard Fergusson who had family living at the Gorton Estate (Karapiro) in the 1870s. The bridge was opened in 1964 with the firm North, Swarbrick, Mills and Westwood winning an award for its design. In 1967 Easter & Sons shoe store celebrated 50 years in Cambridge. United tractors had their showroom built in Pope Terrace in 1967 at the same time as Mr Whippy was trying to get permission from the Borough Council to sell his ice cream around the borough. In November 1968 Waikato Motors Ltd moved to new premises in Commerce Street. In June 1969 Farmers Trading Co Ltd celebrated their 60th Jubilee and in July the Cambridge store announced it was going out of the grocery trade and concentrating on drapery, clothing, manchester, hardware and home appliances. Aotearoa Meats started to build a £400,000 abattoir on their Leamington site in 1965. The Cambridge Borough Council had established an abattoir on the 31 acre site in 1926 and this had a capacity for 500 pigs, 500 sheep and 25 beef. Later the local butchers formed the Cambridge Abattoir Company and ran the abattoirs until the plant was leased in 1958 to Messrs J Segedin and N L F Taylor. The new abattoir was centrally situated and able to cater for killing meat for the Waikato, Northern King Country, Thames Valley and Bay of Plenty. The top floor handled mutton, beef and pork as well as the staff amenities while the bottom floor held the plant for processing skins, hides, tallow and meat-meal. In 1970 Aotearoa Meats Ltd (considered the most modern in New Zealand) was granted an export licence and another million dollars were spent on enlarging and upgrading the works. In 1968 the Borough Council bought the old Boiling Down property adjoining the borough rubbish tip in Leamington. Leamington was moving ahead with 20 new homes built in 1964. Shakespeare Street needed a traffic filter on the corner of Cook Street and a lot of work was carried out to drain the water. The Post Office opened in Leamington in March 1968. And it was found in 1969 that sewerage restrictions would limit the sub-division in southern parts of Leamington. In late 1969 the whole of Cambridge underwent a full assessment of providing finance for the sewerage reticulation for the Cambridge Borough. In 1965 the water treatment station at Karapiro was completed. This enabled water from Lake Karapiro to be filtered, chlorinated and stored in a new 500,000 gallon reservoir. 1965 Speight Pearce Nicoll & Davys Ltd merged with Taupo Totara Timber Co.
1966 the Hamilton Airport opened, thirty years after the Waikato Aero Club had commenced. 1966 the rubbish collection in paperbags (as opposed to bins) was introduced. 1967 the Cambridge Borough civil defence plan was completed with Mr Roy Nairn as Controller. 1967 the Cosmopolitan Club came into being. 1969 a new caravan ground was opened at Karapiro Lake. In July 1967 decimal currency changed our arithmatic to mathmatics and October the same year the hotels changed to 10pm closing. In December wine in boxes – a modern version of the wine skin – was becoming popular and later in the decade tea bags made their appearance. In 1962 the old manual training school in Victoria Street was made available to the Youth Centre (about 100 members) but in 1968 this was sold, the building removed and the property became Waikato Motors new home. In 1962 Cambridge had three indoor basketball teams. In 1964 Miss Adrea Brunskill was notching up placings in the NZ pentathlon and the 80 metre hurdles. In 1965 Susan Litchwark and Allan Weidenbohm put Cambridge on the skating map when they won gold for roller skate dancing and represented New Zealand in Germany. Miss Allison McMillan was representing New Zealand at swimming and the club, as a whole, was most successful. Polo was making a home for itself on the Vogel Street green belt and Pam Buckingham and Alex Boyd were excelling at squash. In 1966 – 67 the Soccer Club was preparing to move to Vogel Street. In 1967 the Leamington Bowlers opened their new clubrooms, Leamington Rugby Club opened their new pavilion and Slot Car Racing started in Cambridge. 1969 saw the Golf Club extend their clubhouse, there was a revival to rowing and the Waikato Hunt bought land on Fencourt Road to house the hounds. The Cambridge Rabbit Board, which had been formed in 1953 with the amalgamation of Maungakawa, Whitehall and Taotaoroa rabbit districts, went out of existence. On 1 April 1968 the area was divided among the Waikato County, East Waikato and Piako County Rabbit Boards. Opossums were now an added menace. The Roto-o-Rangi dairy factory was the last subsiduary factory of the Cambridge Co-operative Dairy Co Ltd to close in 1969. At the same time Hautapu opened their new casein factory and bought a neighbouring farm as a means to dispose of the casein whey and washing water.